A plethora of aphid species attack commercial crops. Until now preventative biocontrol strategies relied mainly on a mix of parasitoids, each with a specific and often narrow host range. Aphid biocontrol hence remained quite challenging. Go for a more robust solution and include Biobest's unique new Sphaerophoria-System based on pupae of the predator Sphaerophoria rueppellii. 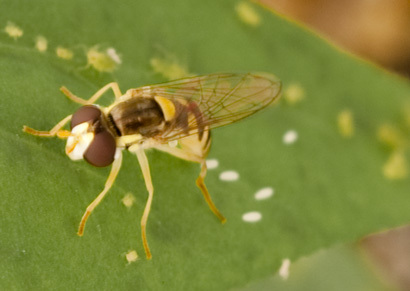 Commonly known as hoverfly, Sphaerophoria rueppellii is native to Europe and Mediterranean countries and predates on several key aphid species including Macrosiphum euphorbiae. This predator can also survive while feeding on whitefly, thrips and spider mites. The development has been focused on sweet pepper, but Sphaerophoria-System is poised to also improve aphid control in a range of other vegetable, fruit and ornamental crops. Adult hoverflies feed on pollen and nectar while the larvae are voracious predators of the main aphid species. Adult females lay oval shaped grey-white eggs, up to 20 a day and 400 in total, in aphid colonies. These hatch into green larvae, voraciously feedering on aphids. During the larval stage, lasting 9 days at 25°C, a single S. rueppellii can consume up to 200 aphids. Sphaerophoria rueppellii is active between 12-40°C, with an optimal range of 25-35°C, although activity may reduce in autumn as daylight decreases. While adults can tolerate drought conditions, the larvae need sufficient humidity to thrive. Sphaerophoria rueppellii can makes its entire lifecycle in a sweet pepper crop without additional flowering plants. Sphaerophoria-System is easy to release. The 125ml Sphaerophoria-System bottle is user friendly. Just open and place it inside a Biobox. Hang the Biobox in the plant avoiding direct exposure to sunlight. The recommended rate is one to four release points per hectare. Biobest's commercial introduction of Sphaerophoria-System is the result of a collaboration with BioNostrum, a spin-off company from the University of Alicante.